﻿ ﻿﻿ Forsyth County is weathering the loss of jobs during the Great Recession in part due to its strategy of attracting high-tech medical research companies. In the future, facilitating the transfer of technology from the university setting to the business setting will become more and more important. A “legacy” of R. J. Reynolds Co. for Winston-Salem will be the Piedmont Triad Research Park (PTRP). 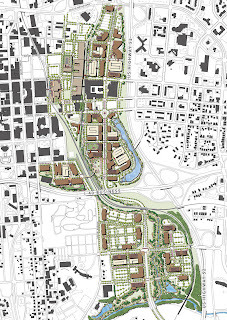 Having a 100-acre research site at the edge of downtown near ancillary retail services and housing provides an appealing urban environment for researchers. The potential growth in high-tech jobs, particularly in biotechnology and life sciences, could be significant. To attract higher-paying employers, both our present and future work force must have the capacity to learn new skills when needed. Forsyth Tech has received national recognition for its bio-technology training program, one of several successful retraining programs.